A rare Saturday night card in the fall of 1980 assured Richmond fans of witnessing the crowning of a new champion, as the vacated NWA Television Title was up for grabs in a one night tournament. As it turned out, the capacity crowd in the Richmond Coliseum would also see a second new champion crowned, as Ricky Steamboat won his first Mid-Atlantic Heavyweight Championship at the expense of the hated Iron Sheik. Sixteen of the top grapplers in the wrestling game comprised this Tournament, which was necessitated by the Masked Superstar vacating the Title in September of 1980. The Superstar became embroiled in a feud with Gene Anderson and his “Army” after being repeatedly interrupted on television interviews by Anderson, Jimmy Snuka and Ray Stevens. Superstar’s issues with Anderson prompted him to turn into a “good guy,” where he gave up his NWA TV Title to go after Snuka and Stevens, and their NWA World Tag Team Championship belts. Against this backdrop, Richmond was selected as the place to fill Superstar’s vacated NWA Television Title! In the weeks leading up to the Tournament, the television promos for the big card gave fans some idea as to who the promotion was touting as the favorites to walk away with the big prize. On the “bad guy” side, both Mid-Atlantic newcomer “Rowdy” Roddy Piper and “Bad Boy” Bobby Duncum did several joint interviews talking about the Tournament in Richmond. Predictably, both of these villains predicted victory! Roddy Piper at this time had only been in the area for about a month, but already was starting to make his presence felt with an ultra aggressive ring style, sharp one-liners and playing the Scottish bagpipes more than most could stand! Duncum was also riding high at the time, even bringing the Texas Brass Knucks Title into the area for a short time. On the “good guy” side of the ledger, the television promos done by Paul Jones, Blackjack Mulligan and Sweet Ebony Diamond were a bit less boisterous. Each of the good guys emphasized that talk was cheap, and that they were going in with positive attitudes and would do their best. Certainly conditioning would be a major factor in determining the winner of the Tournament, as the ultimate victor would have to wrestle and win four matches…all in one night. No small feat! For the fans in attendance, the best part of the Tournament may have been the renewing of hot rivalries during the course of the evening. The former Mid-Atlantic Tag Team Champions Matt Bourne and Buzz Sawyer crossed paths with their chief tormenters of the time, and then the current Champs, the Sheepherders---Butch Miller and Luke Williams. While this was really a mid-card feud, it was heated, and fans got to see a lot of the animosity between these four flare up during the Tournament! Another feud that was heating up, and that got a boost during the Tournament, was the program between the returning (after a five year absence from the area) “Russian Bear” Ivan Koloff and Sweet Ebony Diamond. Koloff was out for revenge against Diamond for breaking the rules in a Loser Leave Town match on the west coast, and forcing Ivan to depart that territory. Ivan was carrying a shovel to the ring, notching it after each victory. Unfortunately for Diamond, he would also smack the shovel into Diamond’s ribs every chance he got! These two crossing paths in the Tournament ensured that their feud would stay hot, and that neither would win the NWA TV Title this night! Similarly, the participants in one of 1980’s biggest programs also knocked each other out of the Tournament. Blackjack Mulligan and Bobby Duncum had been going at it tooth and nail for several months in a battle for Texas supremacy prior to the Tournament, and all the bad blood spilled over during this Saturday night at the Coliseum! These two obviously enjoyed beating each other up, more than winning the NWA Television Title! When most of the smoke describe above had cleared, there were two wrestlers left---Roddy Piper and “Number One” Paul Jones. In what had to be categorized as a major upset, the brash Piper upended the veteran Jones in the final match, and became the new NWA Television Champion---to the shock of most in attendance. Being the fourth match of the night for each man, the final bout was relatively short. However, Piper had spurts of energy that seemed to catch Jones completely by surprise! Piper also showed fans his grit and toughness as well, enduring a long spell in Jones’ Indian Death Lock, but never submitting. While Piper caught Jones for the pin using some of his infamous illegal tactics, it was nevertheless the first of many title victories by Piper in the Mid-Atlantic area. Piper would hold onto the NWA Television Title into early 1981, when he captured the United States Heavyweight Championship from Ric Flair. In a memorable episode of Mid-Atlantic Championship Wrestling from January of 1981, Piper offered to “give” the TV Title to Ric Flair as a consolation prize of sorts after defeating Flair for the U.S. belt. In an interesting twist, while failing to win the TV Title that the Superstar had vacated, Paul Jones would soon team with Superstar later in November of 1980, and that unlikely combination became the new NWA World Tag Team Champions. 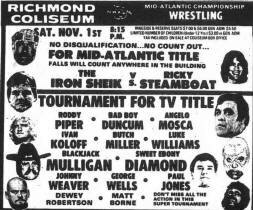 In the Mid-Atlantic Heavyweight Title match that concluded this night of wrestling action in Richmond, the reigning title-holder the Iron Sheik and Ricky Steamboat were set to battle in what would be the culmination of a brief, but bitter program. The match was full of special stipulations, two of which were highly unusual. In addition to No Disqualification, No Count Out stipulations, there was also a provision that falls would count anywhere in the Richmond Coliseum! While this stipulation became almost commonplace some years later, in 1980 it was exceedingly rare! And the two combatants in fact spent a great deal of the match trying to capture falls on each other outside of the ring! An unusual stipulation that the challenger Steamboat made during the promos leading up to the title match, was that he would throw out 1000 one dollar bills to the fans if he didn’t win the Title from the Sheik! Despite that pledge, there didn’t appear to be anybody in the Coliseum rooting for the Sheik to win---even though that would have meant that money would have been thrown out to the fans! There certainly was no more hated wrestler in the Mid-Atlantic area at this time, than Hussein the Arab, the Iron Sheik. With the Iranian hostage crisis still ongoing, the last thing Mid-Atlantic fans wanted to see and hear was a boasting Iranian. In pre-match promos, Steamboat encouraged all the Richmond faithful to bring American flags to the Coliseum and wave them on this Saturday night. And did they ever, along with unending chants of “U-S-A”!! The match started out deliberately, with the Sheik refusing to stay in the ring for long stretches. Steamboat would relentlessly chase after the Iranian, leading to long stretches of the bout taking place outside the confines of the ring. With the deafening chants of “U-S-A,” the Sheik seemed to be distracted to no end! Both combatants secured numerous two-counts on the floor, but neither could gain a clear advantage on the outside of the ring. Only when Steamboat caught the Sheik with a flying press from the top turnbuckle nearly 20 minutes from the start of the match, did the heartthrob from Hawaii seize control of the bout. When the three count against the Sheik was finally registered, the crowd exploded, and once again the chants of U-S-A started in earnest. A smiling Steamboat was beaming from ear to ear as he soaked in all those cheers! For at least a few minutes, all the anger and frustrations of the Iranian hostage crisis seemed a distant memory to everyone in attendance! Ricky Steamboat would go on to hold the Mid-Atlantic Heavyweight Title into the year of 1981, for about six months. The Sheik would never regain the Title, after also holding it for around six months after beating “Jumping” Jim Brunzell for the belt. Two new holders of major Jim Crockett Promotions titles walked out of the Richmond Coliseum on this night. That, standing alone, would have likely ranked this card toward the top of Richmond’s all-time list. But the electric atmosphere in the Coliseum that night made this card stand out…one which has to rank in the Top 5 of Richmond’s greatest wrestling nights! Truly, a Saturday evening to remember!